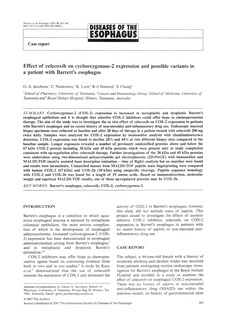 Cyclooxygenase-2 (COX-2) expression is increased in metaplastic and dysplastic Barrett's esophageal epithelium and it is thought that selective COX-2 inhibitors could offer hope as chemoprevention therapy. The aim of the study was to investigate the in vivo effect of celecoxib on COX-2 expression in patients with Barrett's esophagus and no recent history of non-steroidal anti-inflammatory drug use. Endoscopic mucosal biopsy specimens were collected at baseline and after 28 days of therapy in a patient treated with celecoxib 200 mg twice daily. Samples were analyzed for COX-2 expression by immunoblot analysis with chemiluminescence detection. COX-2 expression was found to decline 20% and 44% at two different biopsy sites compared to the baseline sample. Longer exposures revealed a number of previously unidentified proteins above and below the 67 kDa COX-2 protein including 38 kDa and 45 kDa proteins which were present only at study completion consistent with up-regulation after celecoxib therapy. Further investigations of the 38 kDa and 45 kDa proteins were undertaken using two-dimensional polyacrylamide gel electrophoresis (2D-PAGE) with immunoblot and MALDI-TOF (matrix assisted laser desorption ionization – time of flight) analysis but no matches were found and results were inconclusive. Unmatched masses from MALDI-TOF peptide mass fingerprinting were compared with human COX-2 (67 kDa) and COX-2b (39 kDa) using unspecific cleavage. Peptide sequence homology with COX-2 and COX-2b was found for a length of 19 amino acids. Based on immunodetection, molecular weight and equivical MALDI-TOF results, one of these up-regulated proteins may be COX-2b.